Summer Session Off to a Great Start at Riverview! Our Inaugural Annual Alumni Reunion Day! Riverview Students to Shine in Grease! Riverview’s Second-View Thrift Store is expanding! Cape Cod Healthcare pledges to hire 50% of riverview project SEARCH graduates! Riverview Alumni Score for the Win! FROM AROUND THE WORLD TO CAPE COD! New Website Receives High Honors! Riverview’s Second-View Thrift Store featured in Cape Cod Times “Bargains Galore” story. Come see us for yourself! Want to learn more about our programs and see our students in action? Register for an upcoming Information and Tour. 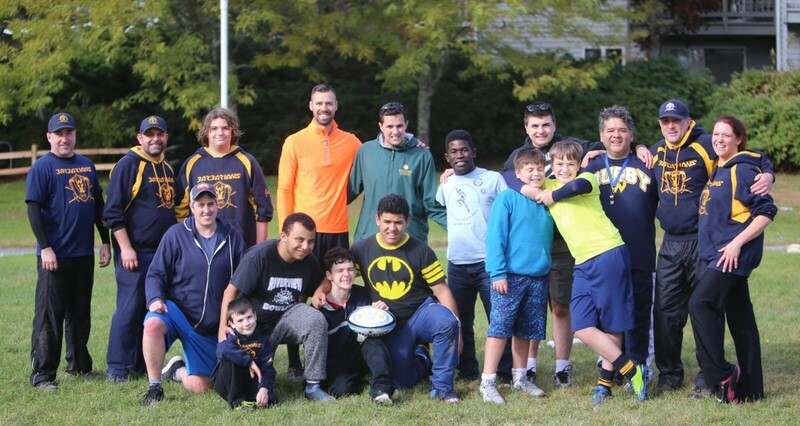 The mission of the Barbarians Youth Rugby club is fairly simple: We aim to introduce the great sport of rugby to as many kids as possible. Rugby is a culture as much as it is a sport - an inclusive culture where players of all shapes, backgrounds, races, sexes and abilities can not only play the sport, but excel at it. We are proud to have brought that culture to our club and we work hard to ensure that all of our teammates participate and have fun. Which is why, when one of our coaches suggested we hold a clinic at Riverview School in Sandwich, MA, our coaches and players all jumped at the chance. Riverview is a private school for students, aged 11-22, with complex language, learning and cognitive challenges. It is a very special place that gives students an environment and the support to learn both academics and life skills, gain independence, express themselves and participate in our society as active citizens. These are kids that may not be given the same opportunities as typical kids their age because people underestimate their abilities. From what we learned out on the pitch with them - DO NOT underestimate these kids! We ran a number of fun drills to give the students, most of which have never seen a rugby ball, a feel for our sport. They quickly mastered the basic concepts: passing the ball, passing the ball while running, running into space and avoiding opposing players. We even had them run relay races while performing complex ball handling (how many of you can run while threading a rugby ball though your legs?). They handled everything we threw at them with big smiles and I think we spotted a few budding rugby stars. It was truly remarkable to see kids, many who are naturally shy, coming out to play with a bunch of strangers who refer to themselves as Barbarians! We are very proud of our club. All of you (named at the bottom of this post) have given the Riverview students an experience they will never forget and we truly believe that you have helped give those kids a little more confidence to try new things. Everyone had a ton of fun and we have already been asked to find a time to come back. At the end of every practice session we always ask our young Barbarians to tell us what they liked about practice. We asked the same question at Riverview. It was heart warming to receive a toothy smile and the answer - "EVERYTHING - I liked everything!". Mission accomplished. Rugby is truly a unique team sport/culture and we are just ambassadors - very proud ambassadors. Thank you to our Barbarians: Coach Daniel, Chief Steve, Coach Alan, Coach Ryan, Coach Rubin, guest Coach Jen, and our players : Joey, Kyan, Brogan, Adam. 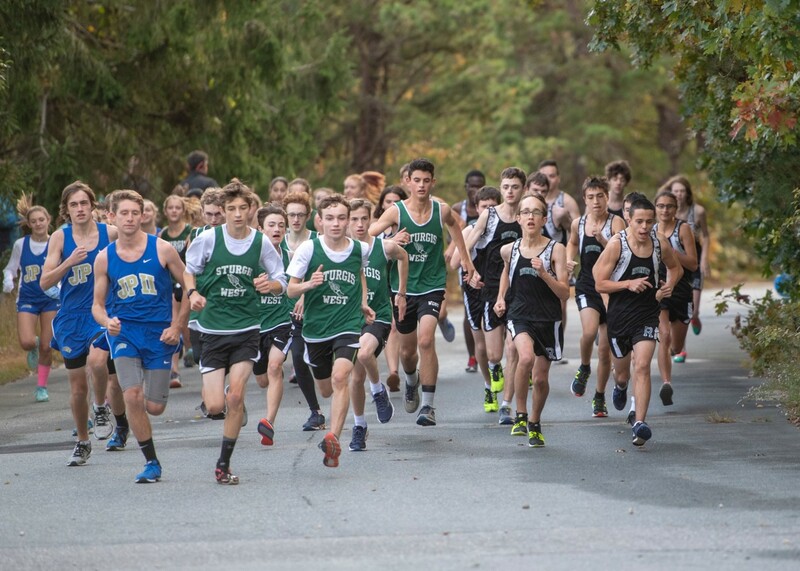 The Riverview Boys Cross Country team earned their first official MIAA victory in school history yesterday at Sandwich Hollows defeating Pope John II 32-27. Sophomore John D. was the top runner for Riverview taking second place against PJP and 6th overall in 17:35 after passing several runners on the final hill up into the finish. Senior Captain Matty G. was next with taking fourth in 18:45 and looks ready to return to his top racing form from a year ago. PJP’s third runner was next but he was followed by a long string of Riverview runners that clinched the victory. Placing in the top ten for Riverview and cementing the victory were Juniors Jacob and Daniel, freshmen sensation Matt, Senior Co-Capt. Jack, and sophomore Miles. Also finishing for Riverview were Thomas, Johnmichael, Tolu, and Elliot. Both Thomas and Tolu lowered their times from last season on the course by over 4 minutes!! Hanna M. continues her assault on the races top five runners and grabbed fourth place overall in yesterday race at 20:17; lowering her own Riverview course record by an amazing 4 minutes! Taisia M. also finished for the Helmsmen. East Sandwich, MA – On Monday, September 10 at 8:15 a.m. Riverview School, located at 551 Route 6A in East Sandwich, MA, will ring the bell to announce the first day of its 61st school year. In Riverview tradition, the entire student body will gather for a joyous Convocation Ceremony. Head of School, Stewart Miller will welcome them to what promises to be a year of transformation, growth, learning and adventures. Students representing 8 foreign countries: Dubai, Bermuda, Germany, Burundi, the Dominican Republic, Singapore, Nigeria, Saudi Arabia and South Africa will participate in a special flag ceremony. 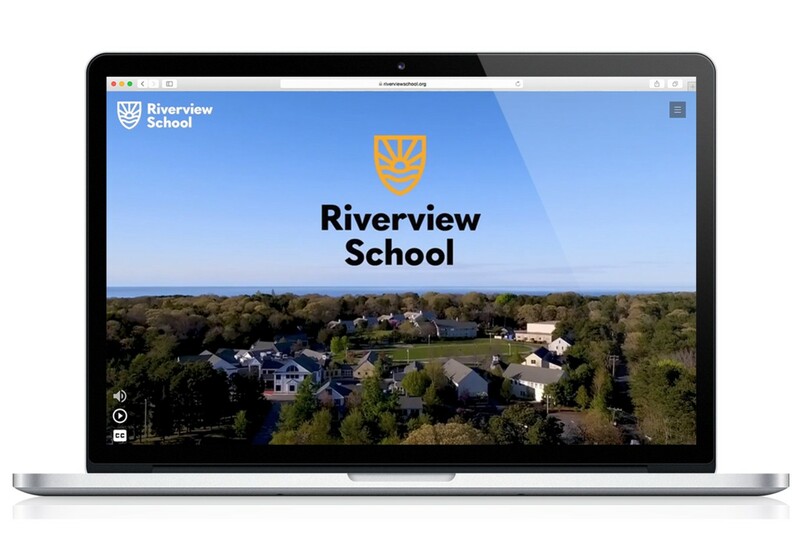 Riverview School, an independent coeducational boarding/day school, provides a caring community for adolescents and young adults with complex language, learning and cognitive challenges. The School is committed to developing student competence and confidence in academic, social and independent living skills. 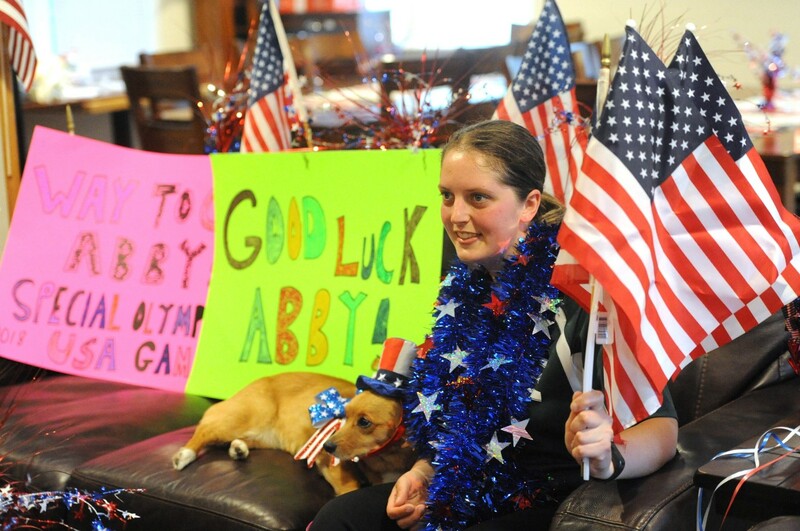 Hyannis resident Abby Tetrault recently competed in the USA Special Olympics games in Seattle, Washington, participating in four events total while representing the LIFE community with her usual positivity. She went with the flow, adjusting to last-minute changes with a smile on her face, all while embracing her role. During the 100 meter dash, Abby placed in fourth out of the nine states. In the 400 meter dash – an event Abby not know she was participating in until leaving for Seattle, but nonetheless embraced – she placed with a bronze medal, coming in third out of a possible nine. In the 4×100 meter relay, her team came in fourth out of ninth. And finally, Abby secured a gold medal in the turbo javelin! It was an amazing showing for a girl who worked hard with all her trainers and took this opportunity seriously. All in all, Abby made new friends, was kind and generous to her teammates, and came away from this experience with a whole new set of experiences and skills. Said Abby: “It was exciting and awesome to get to meet people from all over the United States.” She was thrilled to “have the opportunity to show my abilities to the world and my friends and coaches to show I can do it!” Congrats Abby on an amazing week, and thanks for representing this community with such aplomb. HYANNIS - Abby Tetraul’ character is reflected in her demeanor. Tetrault, 27, diagnosed with an intellectual disability at age 5, almost always wears a calm, relaxed smile. When she steps up to the starting line or is about to begin an exercise during workouts, her eyes focus with determination, but ther’ always a hint of a smile. When she finishes, her breathing is heavy, but she is glowing with a sense of accomplishment. She loves to run, and i’ not long before sh’ ready for more. EAST SANDWICH — Anna Sampson, co-president of the 2018 graduating class of Riverview School, invoked Vincent Van Gogh on Sunday to describe her classmates’ ability to persevere when faced with obstacles and adversity. Riverview’s Program Review by the Massachusetts Department of Elementary and Secondary Education is in. We are proud to inform you that the School was found to be in compliance with all standards and that all requirements were found to be fully implemented. 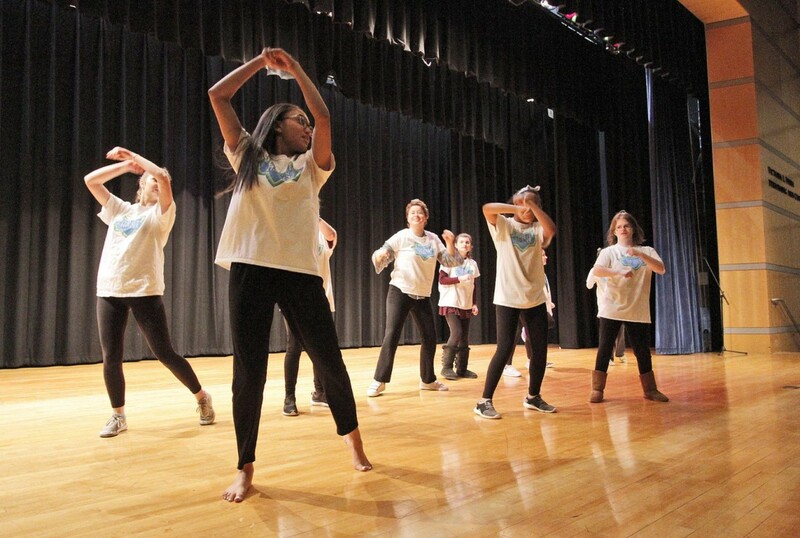 At senior project night at Mashpee Middle/High School on Monday, Brianna Cheatham, foreground, dances with Riverview School students for her “Dance Heroes” project. Michael Poulin was recently recognized as Rivervie’ all-time leading scorer in varsity basketball. Between 2014 and 2018, Poulin scored 721 points. His coach, Jean Russell said, "Michael is one of the most versatile, elegant and selfless players that I have ever coached." He was recognized during Rivervie’ sports awards ceremony, where it was announced that his #15 jersey would be retired in his honor. Way to go Michael! Riverview kicked off our “Mindful Moments Month” by welcoming guest, Tim Donohue of Mindful Skills for Daily Life, who spent the day working with students and faculty on mindfulness practices and meditation. Riverview students and faculty have been challenged to complete 5,000 “Mindful Moments” by April 30 as part of the wellness initiative. Mindfulness posters and kits are now strategically placed all over campus and include instructions for journaling, coloring a mandala, mindful eating, walking meditations and more. Riverview School was recently written about in Ingress Magazine, a national magazine for teens, produced by teens. Journalist, Clare Mulroy wrote, “The Light in Their Eyes” a beautiful 6-page feature story about our students and their experience living, learning and experiencing a typical teenage experience at Riverview School. Ingress Magazine specializes in pursuing the raw, intimate stories that capture the human experience, focusing primarily on human interest and social journalism. Art work from Riverview students, Sarah Burns, Maxine Chu and Will Sandstedt, is being featured in the Cape Cod Museum of Art’s “Through Young Eyes Exhibit.” The trio, along with students from other Cape Cod schools, has had their pieces displayed in the gallery since mid-Feb.
Riverview’s new website was recently featured on Communication Arts website as their “pick of the day.” Check it out here. This is quite an honor—many thanks to our designers at Visual Dialogue. The site features a full-browser, auto-play intro video, created by Big Ocean, to quickly give site visitors a feel for what the school is all about. While it was a challenge to tell the Riverview story in a one-minute intro video, we believe the result is an authentic portrayal of the school. The designers also wanted to give parents a positive introduction to the school, with a bold, bright layout and great imagery. Primary photography was done by Ben Gebo. 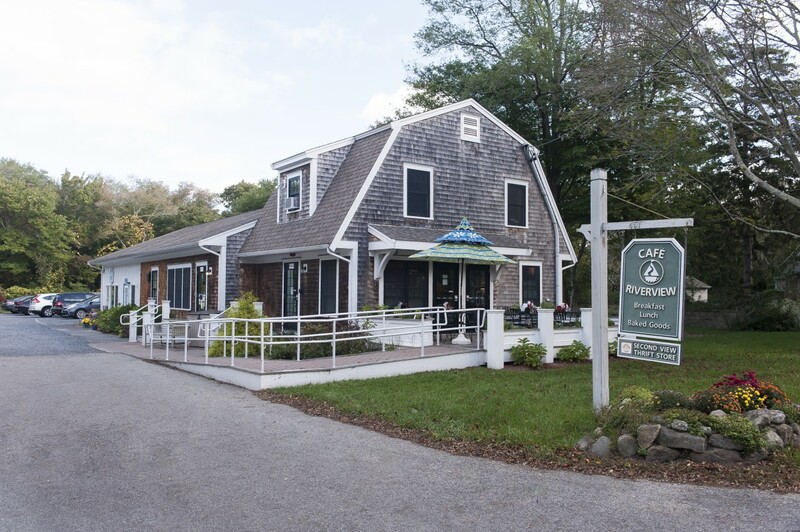 Cafe Riverview included in Cape Cod Magazine’s “Eat, Drink and Be Healthy” article. Please contact Riverview’s Strategic Marketing Manager, Margot Cahoon at 508-888-0489 x200. Experts agree that learning is most effective when it’s multi-sensory. Therefore all teaching at Riverview is presented via a thematic, integrated curriculum. Literature, writing, history, the arts, and field trips are all connected to a central theme. One example of this is the School’s innovative, meaningful and downright fun ‘Hands-on History’ program! They did this by reading the book “Clara’s Quilt” with their classes and developing a map in the form of a quilt with secret symbols. For example, a picture of a bird was a clue for students that a bird call would signal it was time to escape. 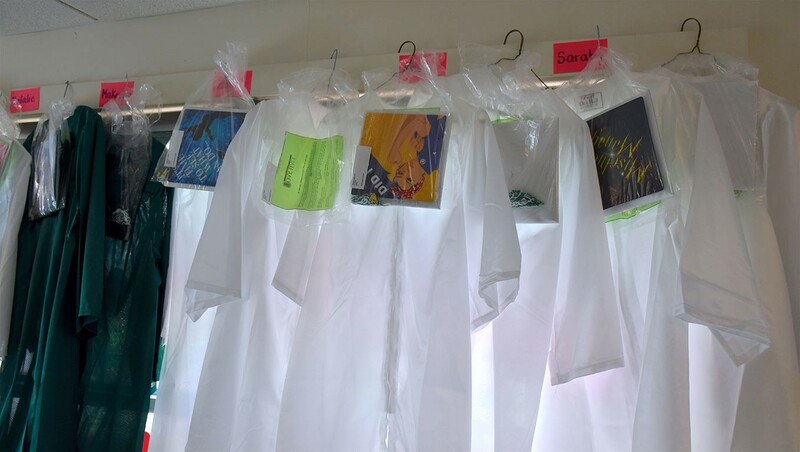 They created a skit involving other teachers as ‘station masters’ and ‘bounty hunters,’ enabling students to experience a ‘perilous nighttime escape.’ The lesson was such a success that from that day forward, all history lessons at Riverview School have been hands-on. Mary Beth agrees. When asked what her favorite Hands-on History lessons have been over the years, she recalls bringing students to Nickerson State Park where they set up a covered wagon and cooked over a fire to learn about the Oregon Trail, and turning the School’s Davis Field into a ‘Field Hospital’ where students learned about the Civil War in the form of a flag football game. Other interesting Hands-on history lessons taught at Riverview include the ‘Age of Industrialism,’ which includes attending a proper Victorian tea and working on an assembly line (to create care packages for underclassmen) and ‘Immigration,’ where students ‘live’ in the simulated steerage class of a ship, cross Castle Garden, and participate in what were typical exams for entry to the United States during this period of history. According to Mary Beth, “All of our students partake in Hands-on History. Some students love to take on the bigger roles, but everyone participates to the best of their ability and to their leaning level.” During a recent lesson about Prohibition during the Great Depression, students wrote biographies, dressed up in character, and presented on famous people who lived during the era, including Amelia Earhart, Babe Ruth and Al Capone. Many students remember Hands-on History fondly after graduation. Right up there with events like prom, graduation and all the fun of dorm life and activities, alumni often bring up Hands-on History as one of the things they loved most about their days at Riverview. IN RESPONSE TO NUMEROUS CALLS, CONCERNS, AND NEW IDEAS WE ARE PLEASED TO ANNOUNCE THAT THE 2018 RIVERVIEW SCHOOL REUNION HAS NOW BECOME AN ANNUAL REUNION DAY! Riverview’s Summer Program is well under way! This five-week, co-educational experience includes half-days at school then afternoons and evenings jam-packed with activities, adventures, and opportunities for furthering independent living and social skills. The summer session is filled by both day and residential students, and has separate middle/high school and GROW transition programs. This summer’s theme is Australia: Land of Diversity, allowing the students to learn more about the country down under and the wider ideas surrounding diversity both in and out of the classroom. Since the summer started, the students have enjoyed every day in classes, in their dorms, and around the Cape and Boston. Lots of time has been spent out in the sunshine and exploring all that beautiful Cape Cod has to offer, as well as on Riverview’s Davis Field and in the Wellness Center. 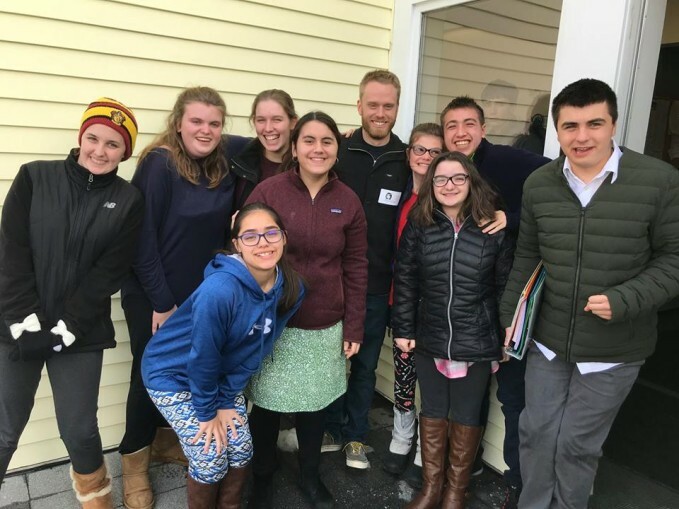 Students visited a ropes course for team building exercises, went to a victorious Red Sox game, attended a Cape League baseball game, and cruised on a whale watch. 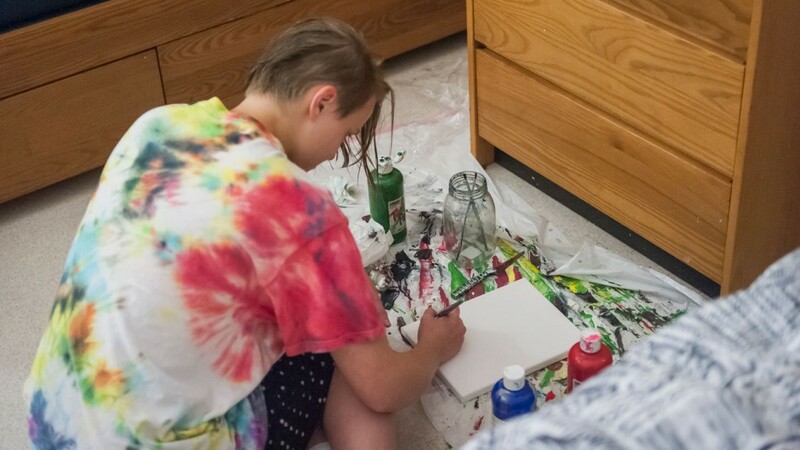 Additionally, many students participated in exciting events on-campus such as magic and bubble shows, tie-dye parties, kickball games, and more. Dorm rehearsals for the annual Variety Show have begun as well, and students cannot wait to perform their wonderful acts in front of their families and friends. 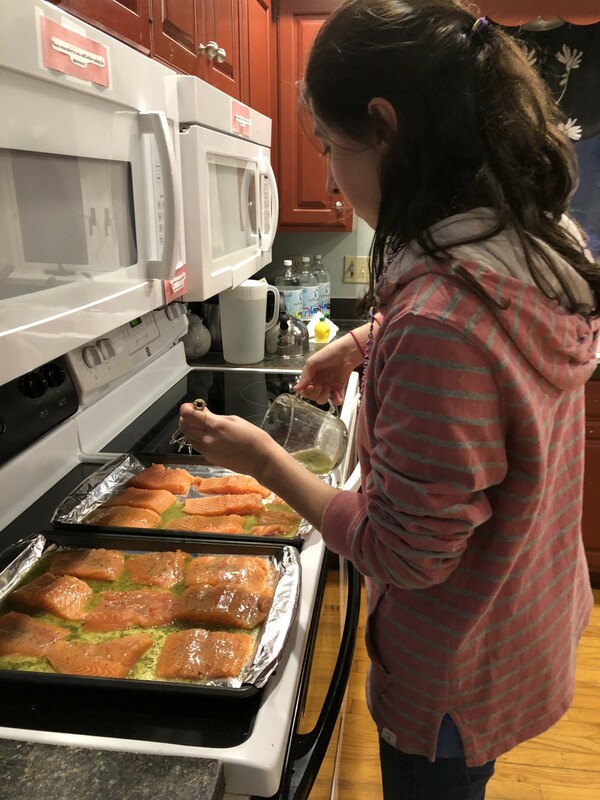 Along with all of these fun activities, the GROW students have used some of their time to go shopping for needs and wants, doing chores in their dorms, cooking, and furthering their vocational skills. Some students are going to a local camp to learn how to be camp counselors while others are continuing their work at local stores, the Riverview Café, and patient care facilities. So much fun has already been had, but there’s lots more to come before the summer is over! Everyone is excited to get to go to Water Wizz water park, and to New Hampshire’s Canobie Lake Park. Students are also looking forward to a basketball clinic, a day in Provincetown or Newport, a deep sea fishing trip, the Barnstable County Fair, and much, much more! Along with all of these amazing plans, students will keep exploring Cape Cod in the summer, learn in classrooms, grow in dorms, and have the best summer of their lives. Brenna, a rising Junior, says that, along with all of the fun activities, her favorite part of the summer has been “making new friends,” and, when asked one word to describe her summer at Riverview, said “awesome!” Here’s to three more awesome weeks of summer, and we hope to see you at our fabulous Variety Show! The Riverview Summer Program is a five-week, co-educational experience, full of adventures, activities, academics, independent living and social skills, and fun! The auctions items were amazing and included a trip to New York City to ring in the New Year, a summer of Red Sox tickets, romantic tropical getaways, fine jewelry, gorgeous art pieces, Head of School for the Day, and much more, drawing in lots of bidders. Additionally, this year’s Fund a Dream focused on technology at Riverview, where we are aiming to continue the growth and integration of technology in our classrooms, both by updating the network and by providing and utilizing adaptive learning tools, Virtual and Augmented Reality, drones, robots, and more. All of this is incredibly important in order to continue building our students’ skills and technical aptitude, but couldn’t be done without the support of the Gala attendees, who raised $440,000 by pledging their support during Fund a Dream. There was even a Virtual Reality station in the tent, where attendees could wear VR goggles and be transported under the sea and around the world, showing guests one of the ways that this groundbreaking technology could be used in Riverview’s classrooms. The technology was kindly donated for the event by Virtual Reality Rental. Along with all of the excitement, the Gala honored Michael and Susan Weiner, Riverview alumni parents who were presented with this year’s “Dream Maker Award,” given annually to someone who selflessly gives of their time, talents, and influence to grow the Riverview community and help it to thrive. The Weiner’s became involved with Riverview in 2001 when their son Zack, a 2008 alum, began attending the school. Mike, a financial planner, offers free services to all Riverview parents to assist them in planning their child’s future beyond Riverview, and both he and Sue have continuously worked to build a foundation of information and support among alumni families and parents of children with special needs, directly impacting hundreds of families and their children, aiding the Riverview community and beyond. This year’s award was especially noteworthy because it was the first time in the history of the “Dream Maker Award” that it was selected due to the recommendation of Riverview parents. All of these things, and more, made this night one to remember. It also was a huge fundraising success, bringing in over $842,000 for Riverview, enabling us to continue our mission, grow our technology and more. Thank you so much to all of our supporters, we can’t wait to see you at next year’s Gala! The last week of school may have just begun, but there’s lots left to do at Riverview! Last week the seniors took their final class trip to Canobie Lake Park, a new Riverview tradition which was enjoyed by all. Last week also saw the Yearbook Assembly, a yearly tradition in which the graduating seniors process onto the stage and graduation speeches are given, giving the student body a sneak peek at graduation. Before the ceremony, every senior wrote a letter to an underclassman, and they delivered the letters throughout the audience, ending with everyone in the room receiving one. These letters reflect upon the seniors’ last year of high school, and typically reminisce on favorite memories with the recipient, and give them some advice about how best to use their time at Riverview. They distributed the letters to “Kind and Generous” by Natalie Merchant, the song the Class of 2018 chose for both this occasion and for the upcoming presentation of diplomas to parents at graduation. This year’s yearbook was dedicated to Lissa Hanson, assistant head teacher of Senior Team, because she “always makes learning fun and gives good advice,” as one student wrote, and pushes the students to “work harder and try their best,” as another pointed out. After the ceremony, the school went to Davis Field for a schoolwide yearbook signing. Along with this, Bell-Ringing Day took place, and all of the seniors and GROW graduates got to ring the bell in the James center, ringing into a new adventure! Additionally, the Riverview End-of-Year Play is coming up this week, and the students are so excited to perform Grease in front of the Riverview community! Lots of seniors are in the play, and they, along with all of the underclassmen actors, can be seen in an all-school performance on Thursday, and then in two performances on Friday for family and visitors. Jane Amaral, head of Senior Team, says this “outstanding” show is “crazy, crazy good,” and can’t be missed! While visiting parents will enjoy the Village of Dreams Gala on Friday night after the last day of school, the high school students will go on dorm outings to the local zoo. Then prom is the next day! This year’s theme is “Rock the Night Away,” and students could not be more excited. The prom procession will lead to the dance floor for their first dance with their parents, to “One Call Away” by Charlie Puth, and then Charlie DJ Beatz, a 2012 Riverview alum with his own DJ business, will take over the music for the rest of the night. This fun-filled week will wrap up with graduation on the 17th. Once students get into their caps and gowns they will process to the tent for graduation, where they will be celebrated for their personal growth and accomplishments in their time at Riverview, both in classes, in the dorms, with friends, at their internships, and more. The graduation speakers will take time to reflect on each individual student, sharing stories about them and letting the audience know of their achievements and what they are doing next. Over three quarters of the 29 members of the senior class are moving into GROW, with the others taking different paths, and all of the seniors have bittersweet feelings about moving on from part of their Riverview journey. As for now, caps are being decorated, gowns are hanging in the senior hallway, and the tent’s going up, showing that this year is drawing to a close. But there are still a few more days for our seniors to enjoy their last bit of high school at Riverview! This June, Riverview students will once again hit the stage in a Riverview-modified version of the rock and roll musical, Grease. Set in 1959 at the fictional Rydell (Riverview) High School, the show tells the story of working-class teens of the time navigating peer pressure, politics and love. Riverview Drama Specialist, Vicki Summers says that she’s never seen the students so excited about the end of year performance! She shared that between the cast and crew, nearly 100 students are participating in the production, and that all of “the cool cats” are having fun with the 50s slang, music and costumes. Vicki explains that putting together the show is like solving a huge puzzle between the music, dance, acting, scenes, props and costumes. According to Vicki, “While there are challenges that come with incorporating such a huge group of kids, it’s a great challenge to have!” She said that she and Music Specialist, Greg Simpson, have compensated for the large number of students involved by adding more characters and more songs. Staff members are having as much fun as the students with the 1950s style production. Art Specialist, Nate Olin is doing an unbelievable job with the set, as usual, including a really cool, light up drive-in movie sign. Residential staff member, James Grinsell, has built the awesome Grease Lightning car, and Director of Special Services, Meghan Hammond has hit the ball out of the park, finding amazing costumes to fit the period. “The most exciting part of the play is seeing students come out of their comfort zones and shine on stage. They find new ways to express themselves and you see their stage presence grow and their confidence levels soar,” said Vicki. While regrettably only open to Riverview students, staff and parents due to space constraints, Riverview’s “Grease” performances will take place in the James Center’s Lund Auditorium on Thursday, June 14th at 2:00pm and Friday, June 15th at 10:00am and 1:00pm. We know we are stronger when we find synergy with other like-minded organizations. That’s why Riverview School is partnering with Westmark School and Frostig School and Center, both in CA, through a new teacher exchange program. The goal of the partnership is to learn from one another, attract a research partner, and ultimately make a difference not just at our schools and with our students, but to the field of special education. The project, which will last for 2 years, is being funded by the Lund Foundation, which generously supports the work of all 3 schools. Included in the grant is technology to assist in the cross country collaboration. The schools have piloted the selected platform and will participate in a team wide video conference in the near future that will include all three schools and the Lund foundation. This fall staff members from Riverview will visit Frostig and Westmark in California and continue to collaborate. The goal of the program, beyond the enhancement of “best practices,” is to develop a “big idea” that will globally impact the field of special education. Transition Weekend is an annual conference held at the DoubleTree Hyannis. The conference provides an opportunity for Riverview families to meet and learn from a variety of experts and panelists about planning for their child’s needs when they move on from Riverview. Additionally, parents are provided with opportunities to connect and network with each other and our expanding alumni family network. Log into your parent portal to view full details and conference schedule. 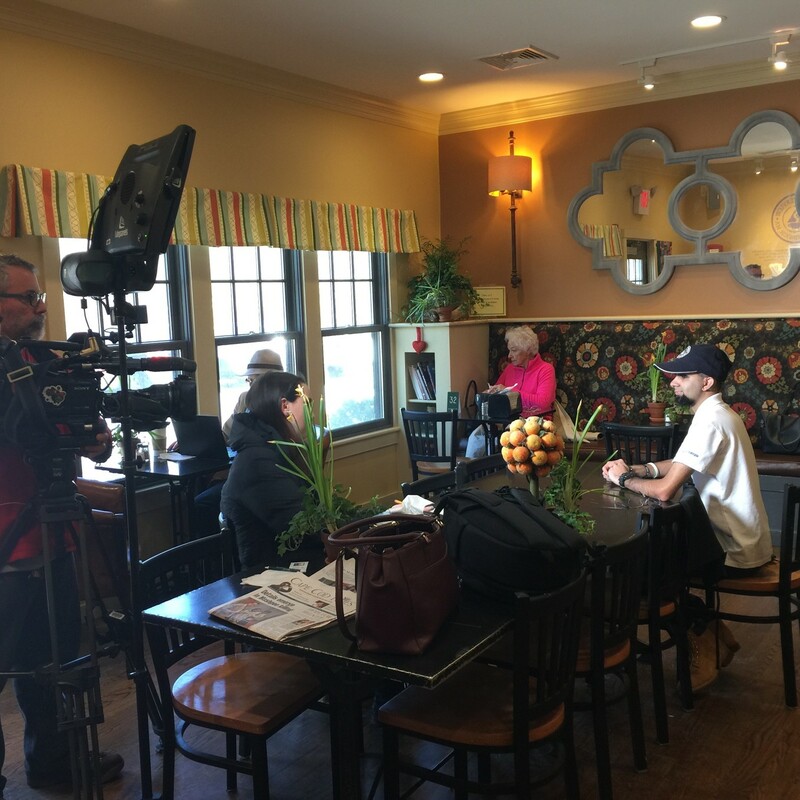 Café Riverview, Riverview School’s “hands-on classroom” was recently featured on WCVB’s “Chronicle” program, “Main Streets and Back Roads of Route 6A.” We are grateful for the excellent press coverage! During the interview, Head of School, Stewart Miller talked about how the Café is a great opportunity for our students to learn about working the food service industry. 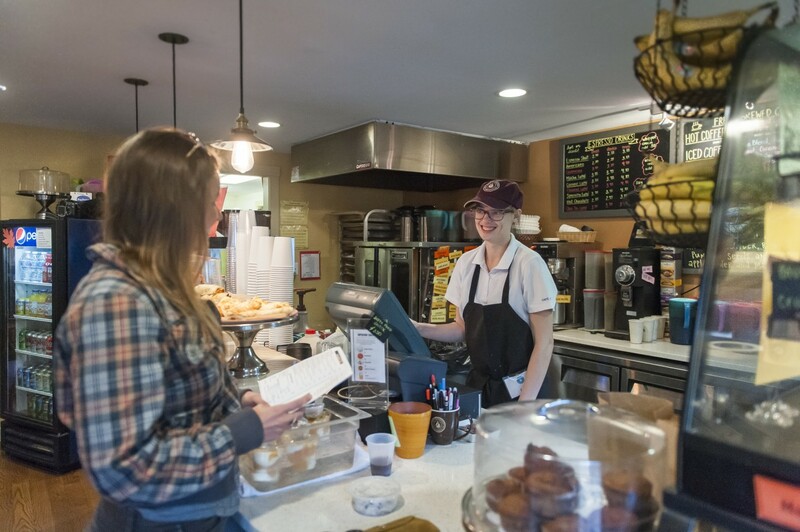 Café Riverview Manager, Cathy Kearney expressed how customers who get to know our students absolutely enjoy it and gain a better understanding of who they are and all they can accomplish. And Riverview student, Basil H., from Pakistan, discussed what he likes most about his job at the Café. The Riverview Road Runners participated in the weekend activities at the Hyannis Marathon including manning a water stop on both days during the 10k on Saturday and during the downpour all day Sunday at the Marathon. The team received an incredible $2,500 donation to the school for their efforts. 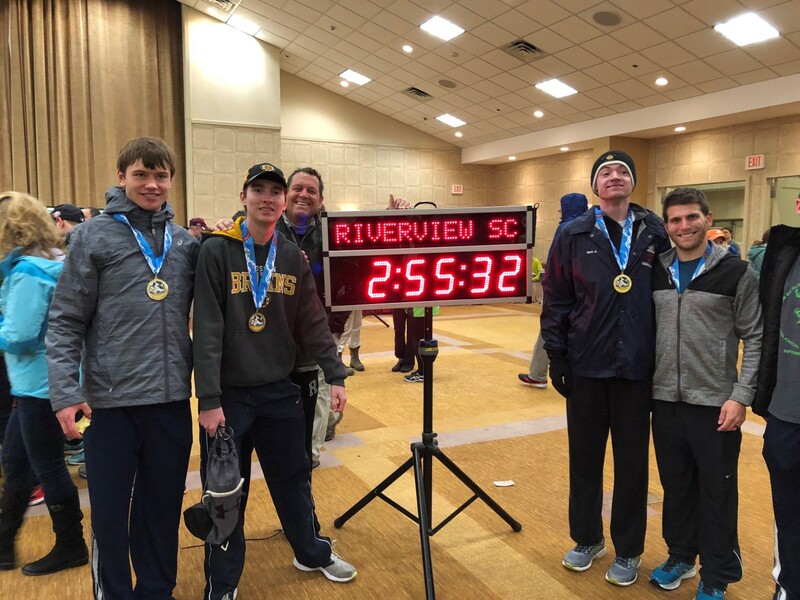 The team had three students run on Saturday in the 10k with Tyler Davenport, Sean Dawson, and Drew Goydas all finishing in just over 50 minutes for the 6.2 miles! Riverview alumni Nicky Reagan also ran finishing just ahead of the trio in 50 minutes flat. The Road Runners brought out its big guns for the relay competition with Luke Anderson, Ryan Aylmer, and Liam Bentley forming up with Coach Ryan Nolette to challenge some of the best running clubs in the area including several teams from Northeast University. The three boys displayed an incredible amount of desire determination and dedication throughout the winter by training independently and competing competitively in the winter grand prix series in preparation for this week’s race. They ran with grit on Sunday in deplorable conditions with a cold rain and massive puddles throughout the course. Luke Anderson led off for the squad and stayed with the leader pack from the half marathon and ran his 7 miles in an incredible 45 minutes! Liam Bentley took the handoff at Craigville beach and steamed his way through Centerville back to the conference center holding his own with a just over 7 minutes per mile pace. Bentley handed off to Ryan Aylmer who ran the most inspiring race of the day sticking with one of the top marathoners as the course wound its way around the Kennedy compound. Aylmer had to go through puddles that some 2 ft. deep in areas along Kalmus beach and put down a final mile towards Craigville beach that was gut wrenching and left him wobbling into the arms of his dad as he made the hand off with coach Nollete. Coach Nollete’s response after seeing Aylmer finish was to start out at a 5:20 mile pace. That would lead to him passing several of the relay teams just ahead of us and into the finish with an amazing time of 2:55 minutes for 26.2 miles!! The team was an incredible fifth overall and 2nd in the men’s open age group. The volunteers under the direction of Coach Kyle Merrill worked just as hard handing out water, Gatorade, and energy snacks to almost 2,000 runners. Huddled under the team tent volunteers blasted tunes and keep up runners spirits as they slogged their way by. Our kudos goes to Cam Vendetti, Drew Goydas, Sean Dawson, Zack Gittleman, and Paul Hart for working so hard in the pouring rain. Riverview’s faculty and student “Eat Well, Be Well Challenge” ended on Friday but healthy eating hasn’t. “Our goal is to keep the momentum going and continue the great strategies that make healthy eating a lifestyle, not just a short term diet,” explained Wellness Coordinator, Thomas Black. There has been increased awareness around healthy food choices increase over the past 4 weeks. And Dining Hall staff reported more vegetables being served during the challenge. Additionally, many dorms incorporated new healthy snacks and meals into their menus. Congratulations to the grand prize winners—Torrey Dorm (avg. 211 points) and Brenner Hall (avg. 253 points). In recognition for their dedication to healthy eating, the winning teams will attend a fun, interactive cooking class with a professional chef! Cape Cod’s very own, Mike Trapp stopped by Riverview on his way to South Korea to complete as a member of the USA Olympic Snowboarding Team. He encouraged students to dream big and work hard for their dreams. Here’s a story about his journey. Best wishes, Mike. W’l be watching you on TV! 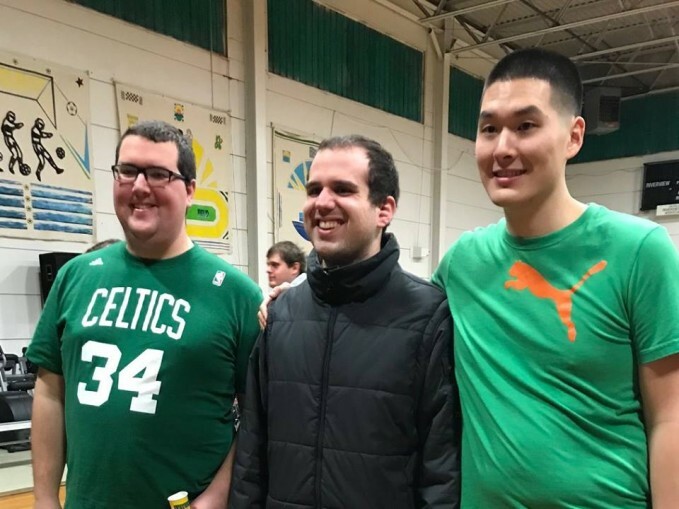 We held our Alumni Basketball Game & Ice Cream Social on Friday February 2nd. In a really close game (56–55) the staff and alumni beat the reigning champion alumni team. What an exciting night! Congrats to all players and thanks to everyone who came out. We are proud to announce that Riverview Visual Arts Specialist, Nate Olin, recently won the prestigious “Juror’s Choice Award” at the Art Foundation of Cape Cod’s Winter Art Exhibit. Visit Cotuit Center for the Art’s now through Feb. 10, 2018 to check it out. Congratulations Nate! The non-profit organization and performing group, The Young Americans, based in Southern California, came to Cape Cod for a 2-day stop along their International Music Outreach Tour to teach music to our students. “The performers have so much passion and enthusiasm and connected so well with our students. Our students stepped out of their comfort zones and discovered passions and areas of strength. They developed confidence and felt wonderful about their connections with the Young Americans. These young performers made our students feel special and capable. 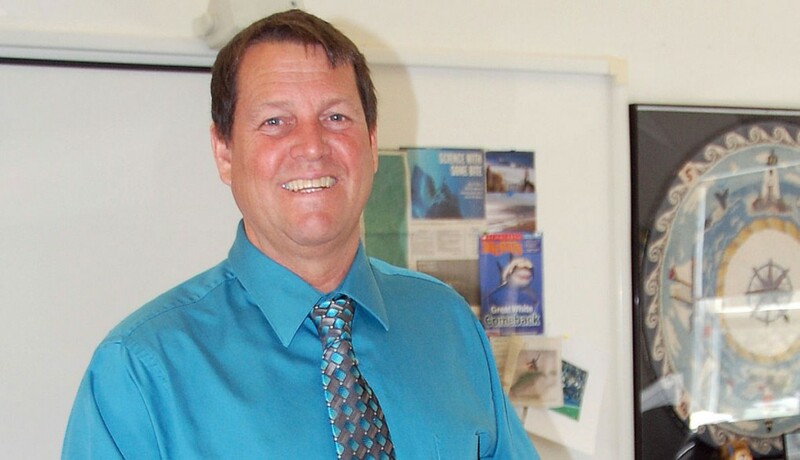 Both faculty and students have expressed such gratitude for this opportunity- it is clearly a highlight of the school year,” said Stewart Miller, Head of Riverview School. Students from both schools visited each other’s campuses and learned that they are more alike than they are different. Check out the article in the Cape Cod Times. 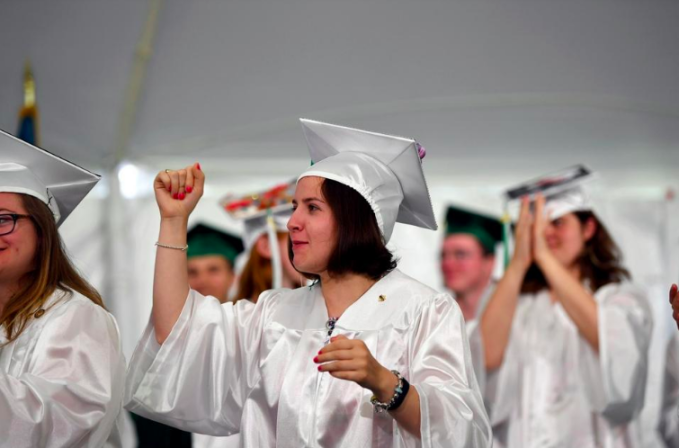 Read about Cape Cod Healthcare’s committment to hiring Riverview grads in this article in the Cape Cod Times. Every class of high school graduates is lauded by their teachers for their strengths and accomplishments, but Riverview School’s Class of 2017 went beyond receiving mere praise. 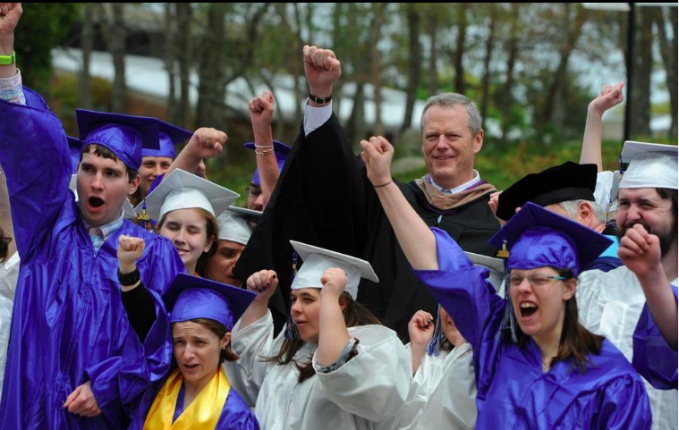 Read about Riverview’s Senior Class in this article in the Cape Cod Times. Deanna White, Director of Clinical Services at Riverview, receives “2017 Excellence in Field Instruction Award” at Boston University. See the article in Cape Cod Today. This year, Riverview School has decided to separate the High School and GROW commencement ceremonies. This allows us to honor the unique nature of each of these special traditions. GROW Graduation will be held on Saturday, June 17 at 12:00 p.m. in Lund Auditorium. The High School Graduation will be held on Sunday, June 18 at 10:00 a.m. on Davis Field. The following are links to interviews and articles about Ron Suskind’s book—Life, Animated. The book outlines the life of Owen, Ron and Cornelia’s son, who, after being diagnosed with Autism at the age of three, finds his voice and his way back into the world through Disney movies and songs.